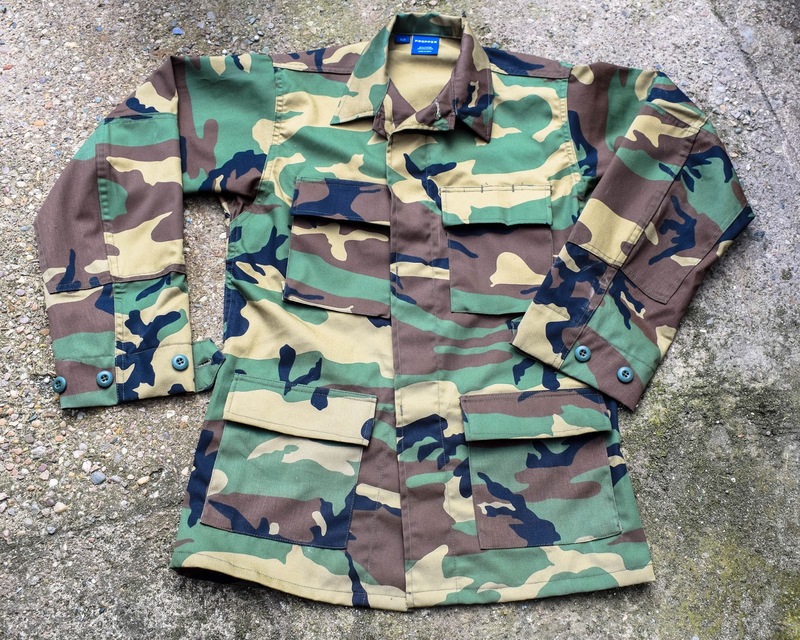 So we’re back once again with another review sponsored by Military 1st and today we’re looking at a couple more items from the Propper range – specifically the Propper BDU Polycotton Coat in M81 (US Woodland) and the Propper BDU Trousers in M81 too! I know you guys love our loadout posts and as Propper are known for their high quality and affordable BDUs this should make for an interesting post! First off let’s talk about the Propper BDU coat – it is a classic, military BDU inspired uniform shirt with a bunch of features that make it a great option for airsofters and other outdoor enthusiasts! From the 4 large buttoned cargo pockets, reinforced elbow patches, the flap covered button up front to its tough shrink and wrinkle resistant polycotton ripstop fabric mean it is a classic style BDU that is made to last. 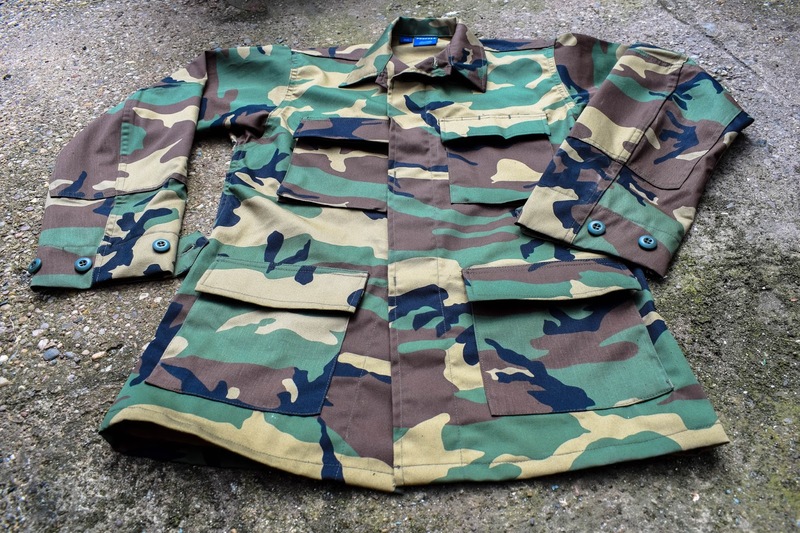 I opted for the M81/US Woodland camo so I can incorporate this into one of my OPFOR loadouts at MilSims I’ll be attending this summer but it is available in a range of colours to suit: dark grey, khaki, A-TACS AU, A-TACS FG, dark navy, black and grey. The shirt is available in sizes XS-L so it covers a good range of sizes especially for those ladysofters out there. When I pulled the coat from its packaging, the first thing I was drawn to was the material – the material is really smooth and feels of a good quality. 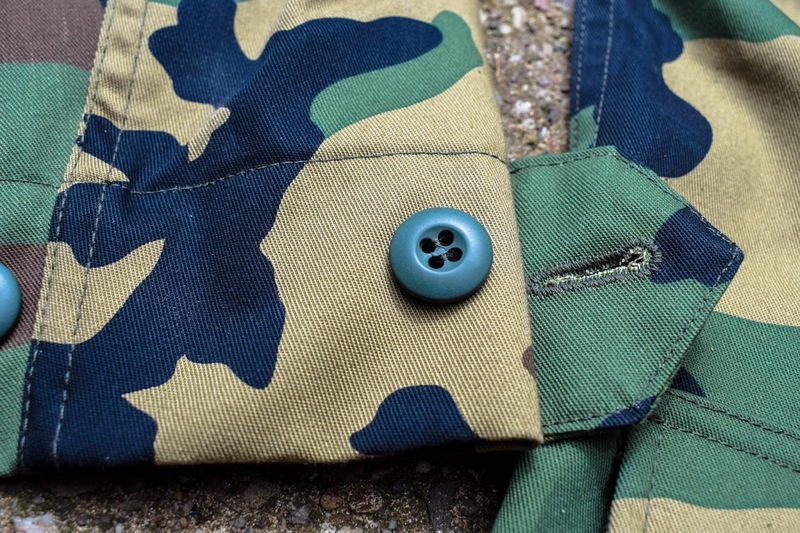 The fused button flaps not only give the coat a smart look but also make it feel/look a lot more expensive than it is and the felled seams throughout the coat enhance durability of the garment and ensure its longevity for the user. The first thing I did (as you will have seen from the unboxing video) was throw the coat on to check the fit. Classically styled BDUs have always been an issue for me due to my small size but I was surprisingly very happy with the cut and fit of the coat. Luckily the cuffs on the arms have a button closure so you can adjust the fit of the arms however I am a massive fan of rolling my sleeves up during games – despite how often I get shot in those areas, and this gives me the look I prefer. The coat offered plenty of movement in the shoulders and arms without making me look like a sack of potatoes – a definite win! 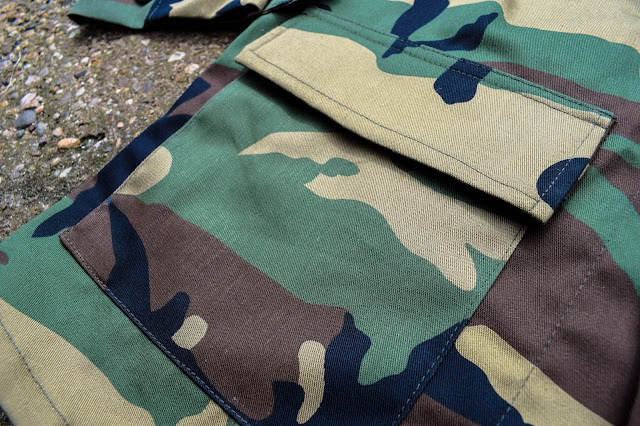 Lastly we have the Propper Uniform BDU trousers and these are again a classic style BDU trouser that is made from fade, shrink and wrinkle resistant material and it has an abundance of pockets for storage and tie cords on the hem to allow for adjustment. Another cool feature that I noticed whilst putting them on was the adjusters on the waist band. 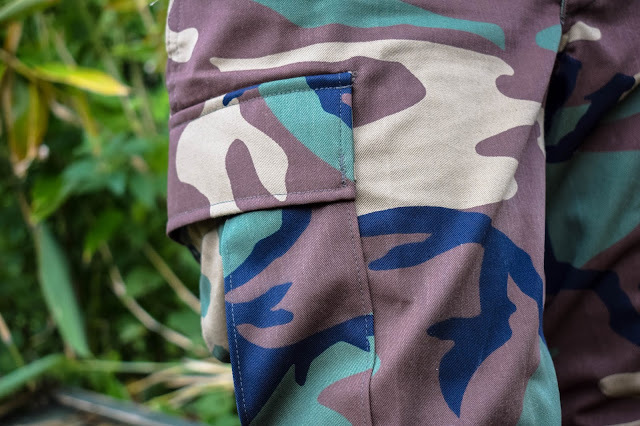 These particular BDU trousers are also available in a large selection of camo options to suit – black, grey, dark grey, Sheriff’s brown, khaki, olive green, A-TACS AU, A-TACS FG, dark navy and of course M81 (it is worth noting that Propper also do a cheaper version of these trousers that come in a different selection of colours, which Military 1st do stock – I’ve linked those here) They are also available in XS-Reg to XL-Reg. 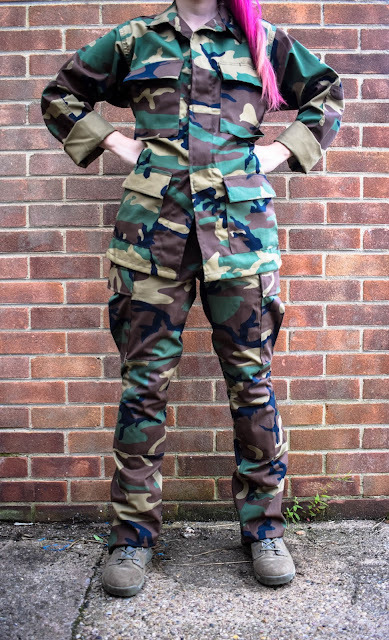 As with the coat the trousers are made from the same fabric – polycotton ripstop so they are durable especially for war gaming activities such as airsoft. 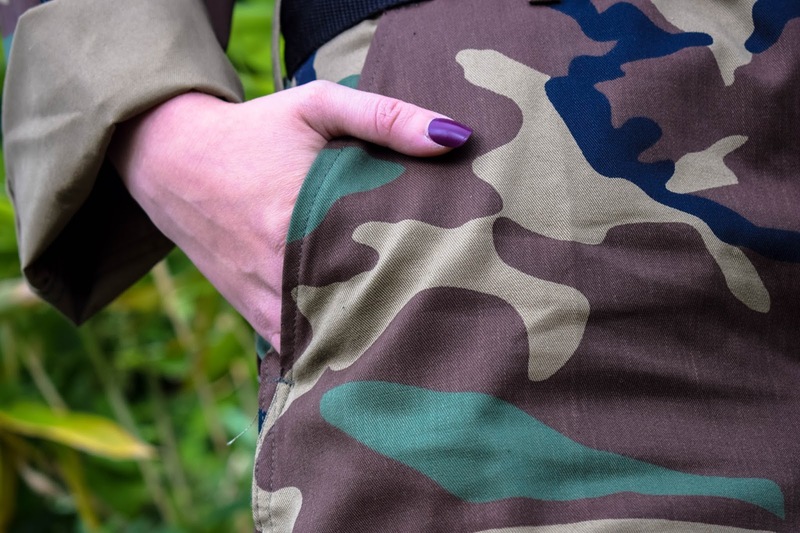 They have a button up fly so are secure and practical, one thing I do prefer in a trouser however is a zip up fly as I have long nails and zips are much easier to do up. So we know they’re a practical option but how do the trousers fit? 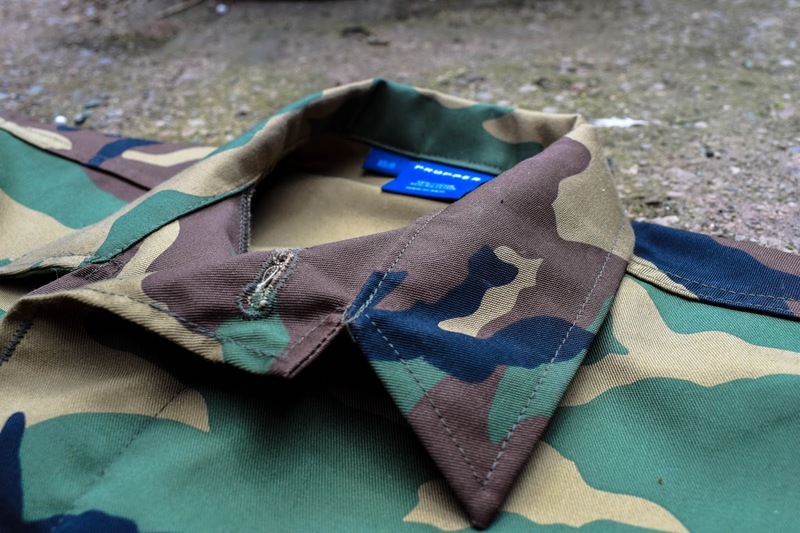 As they are a classic BDU shape they are a little baggy for my own personal tastes – the waist fits well and doesn’t necessarily need a belt, although I do prefer wearing one for aesthetics. The legs are roomy from the thighs to shins, to offer the user movement and the cuff of the trouser ends at my ankle which is a great length. I would probably get these altered for a more tailored look before I wear them for a skirmish. The coat retails at £44.00 and the trousers also retail at £44.00 so together the whole outfit retails at £88, so for a whole BDU set that is durable and long lasting is a great, affordable price, although they maybe a little more expensive than the bog standard army surplus trousers out there but you are paying for the quality of a well-known and well-made branded set. Overall, I love the coat out of the packaging – it feels great, is practical and fits perfectly with no adjustments – it has a tailored look which I am a huge fan of. 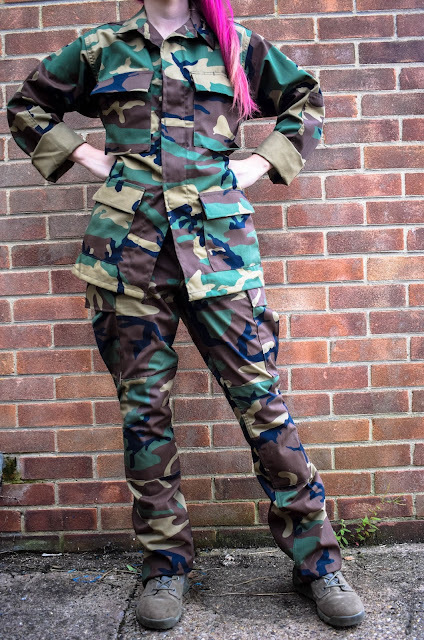 The trousers however, as they are made of the same material they are super practical for airsoft and are durable but they are a little baggy for my own tastes so I would probably have them altered to fit better and achieve a more tailored look. The classic BDU cut however is perfect for men and women who like their trousers to be a little baggier. One thing the trousers do offer is a lot of movement. 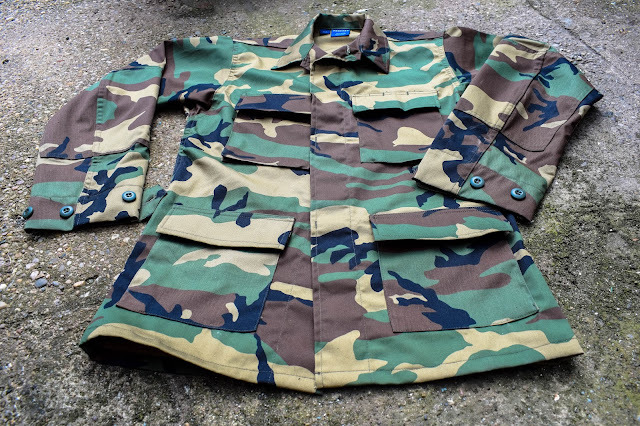 They are an affordable set of camo clothing in a wide variety of camo options to suit every player and can be used for a multitude of different activities from airsoft to paintball to bushcraft and a whole range of outdoor activities. Nice one Military 1st!